Dewy sweetfern in (very) early morning. Comptonia peregrina is native to eastern North America, from southern Quebec south to the north of Georgia, east to the Atlantic coast and west to Minnesota. 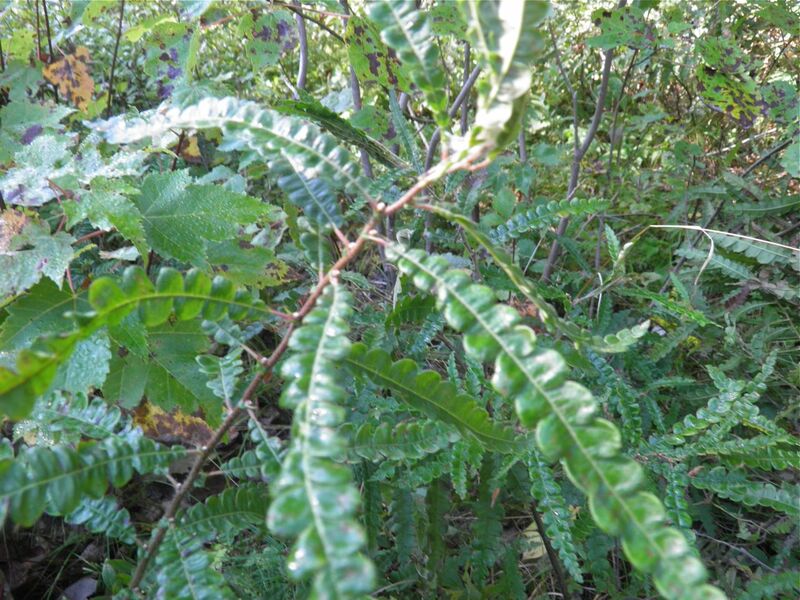 The common name is Sweetfern (or sweet-fern), which is confusing as it isn't a fern at all! Another common name is Fern Gale. 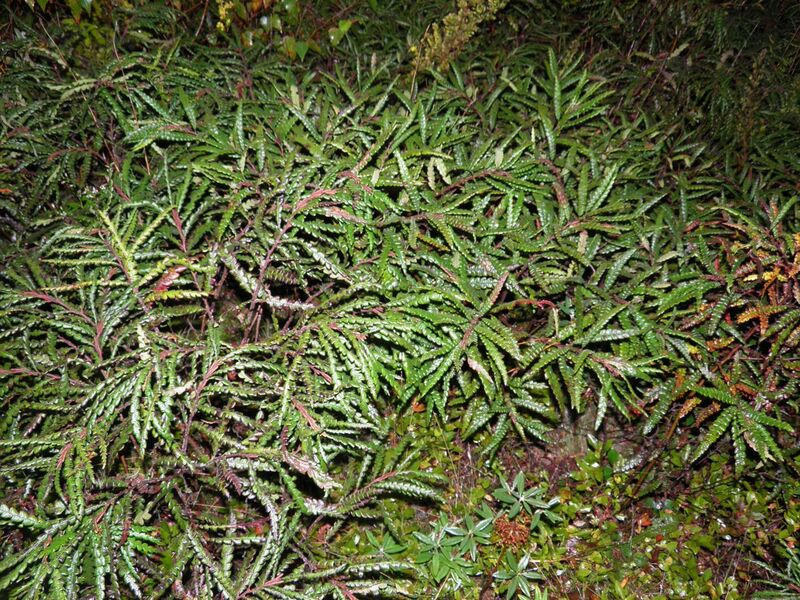 The plant is a member of the Bayberry family. What's so special about this plant? The leaves are aromatic. If you pick the leaves and rub them between your hands a pleasant, sweet fragrance is released. Ergo, the first part of its name. 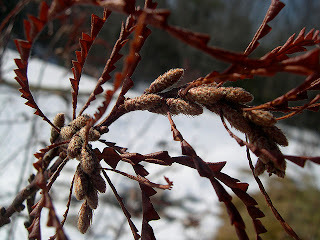 Sweetfern is a deciduous shrub, which means it looses its leaves in the winter. Sources say it can grow to 3 feet tall, although I am hard pressed to remember seeing it grow to more than 2 feet in Nova Scotia. 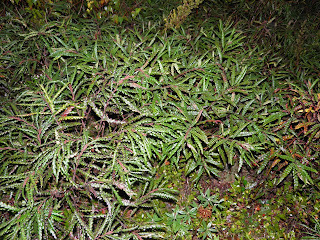 It has a woody stem with multiple branches off from the main stalk. Sweetfern tends to grow in poor soils and seems to favor pine stands – possibly because of the increase in soil pH due to the pine needles. The leaves do look somewhat "fern-like." As a side note, did you know that pine needles under rhododendrons can increase acidity of the soil and help them flourish? Just gather pine needles, fresh or brown, and let them decompose around the rhodo stock. Sweetfern is used as food by the larvae of some butterflies. It is also a non-legume nitrogen fixer. 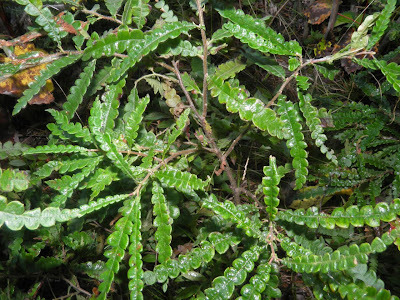 The resemblance of the leaves to those of a fern have given it its common name though the plant is obviously not a fern. Some native Americans are said to have used sweet fern leaves to treat poison ivy. Jewelweed (an earlier post) has the same anti-poison ivy properties. I do know I would have an easier time in Nova Scotia locating sweetfern than that elusive plant. 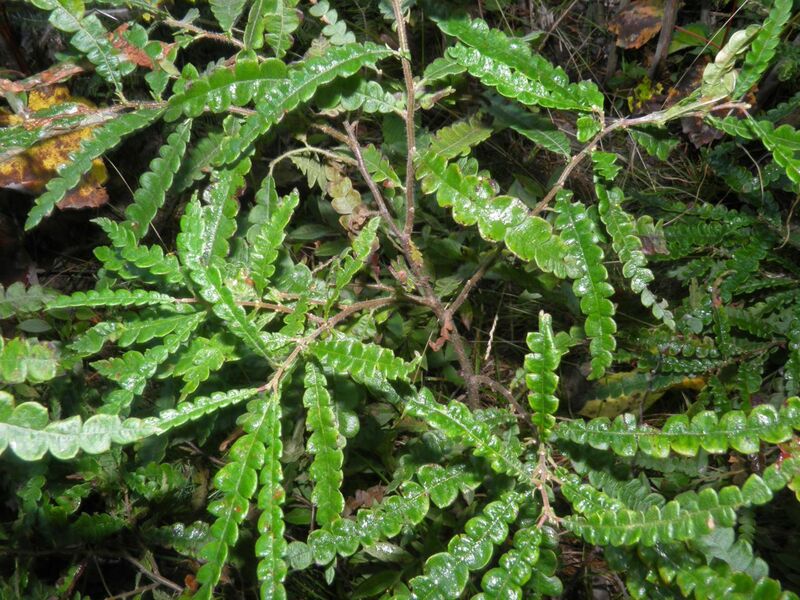 Because of their potential insect repellent properties sweetfern is supposedly able to increase the longevity of fruit in bowls. I have never tried it so I don't know. But I can imagine crushing the leaves would definitely add aromatic enjoyment to your kitchen or living room. Sweetfern can be used as a herb in as many dishes as you're willing to try. To dry it just hang branches inverted for 1-2 days. They dry quite quickly and can be saved whole or crumbled. I have seen recipes where they are used with scallops, fish and chicken. Google "sweetfern recipes" to find out more. Here's a recipe to use the leaves in a tea. I know the smell of sweetfern well. 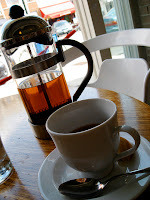 Picturing it in a tea is an interesting idea. I'm definitely going to gather some before it is all killed by frost to try over the winter months. Crush the leaves and either tie up in cloth or place in a tea strainer. Pour boiling water over the leaves and allow to steep for 5 minutes. You may need to press some of the liquid out of the leaves when straining as they will absorb and expand somewhat. Remove the steeped leaves, sweeten, sit back, relax and enjoy!